On Track With a Full Ammo Rack! Our popular "On Track" events are designed to showcase an entire nation's specific tank line and help you unlock and purchase higher-tier tanks! If a line of vehicles is On Track, you'll receive substantial discounts all the way to tier X. We've also got missions to equip your new tier X vehicle while you unlock it. Sometimes you can earn a Premium vehicle! 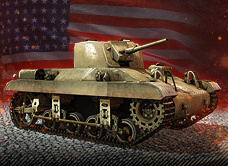 This latest On Track features American light tanks on the currently discounted Chaffee-Bulldog line; some of the most adaptable vehicles in the game. This particular line gets autoloading guns at tier VI with the T37, providing a firepower advantage against light and medium tanks of other nations. While most of this line is light tanks, the tier IX T54E1 is a medium tank, and the line finishes with the T57 Heavy Tank. Have you ever driven a KV-2 or an O-I heavy tank and thought, It's sure nice to fire shells the size of a bathroom trash can, but I wish those big boomy guns were on a faster tank? We've all been there, and the T49 is here to help! By no means as small or nimble as the light tanks before it and lacking an autoloader, this light tank can be fitted with a stock 90mm cannon for sniping. Or load up with a massive 152mm howitzer that'll make enemies sit up and take notice! When commanding the T57 Heavy Tank, it's important to find a good position early, but you don't want to lead the charge or be spotted. Wait until a target shoots first, then fire as many shots as possible into them before you have to break off and reload. With two seconds between each 120mm round in a four-round magazine, you can put a ton of damage downrange! In a face-off, don't worry about taking shots from a non-autoloader just to get three shots into them -- it's all good if it leads to their destruction. And though you can be aggressive thanks to the magazine reload, balance keeping your gun in the fight with minimzing your exposure to enemies. On Track offers gameplay variety, great tanks, the opportunity to save a truckload of Credits, and the chance to earn equipment. Complete all the missions and you can take home a classic: the speedy M22 Locust. It's perfect for training your American light tank Crews while you zip around the map getting bonus Credits! Complete On Track to the T57 Heavy four times. Complete On Track to the T57 Heavy eight times. Complete On Track to the T57 Heavy 10 times.